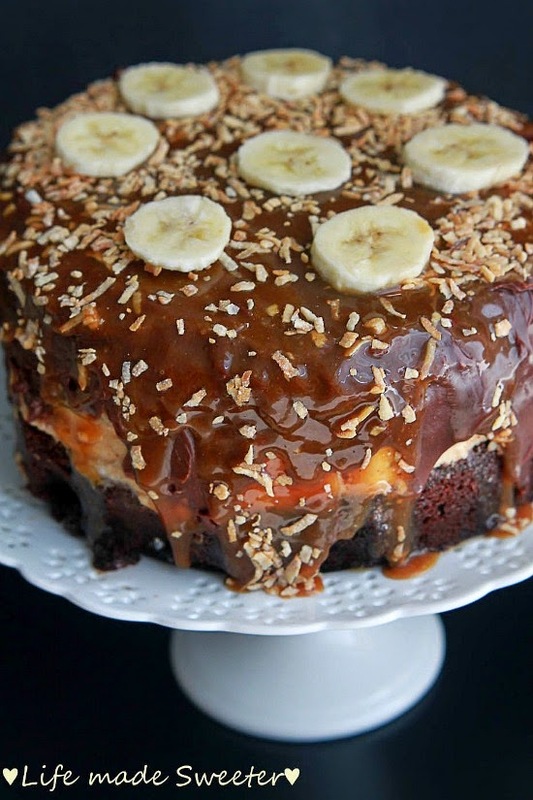 Chocolate Cake with Bananas and Salted Caramel Frosting is a moist, chocolatey cake filled with sliced bananas, toasted coconut and salted caramel frosting. Smothered with chocolate ganache and salted caramel sauce, this decadent cake is sure to impress. We celebrated our 7 year wedding anniversary yesterday and what better way to show my man that my heart still pitter patters for him than by baking him the ultimate chocolate cake. The hubs is a chocoholic with a major sweet tooth. So whenever I ask him what kind of cake he feels like having – he will almost always choose chocolate. Since I usually prefer fruity or tropical cakes, I decided to compromise (because hey – that’s what marriage is all about right?) 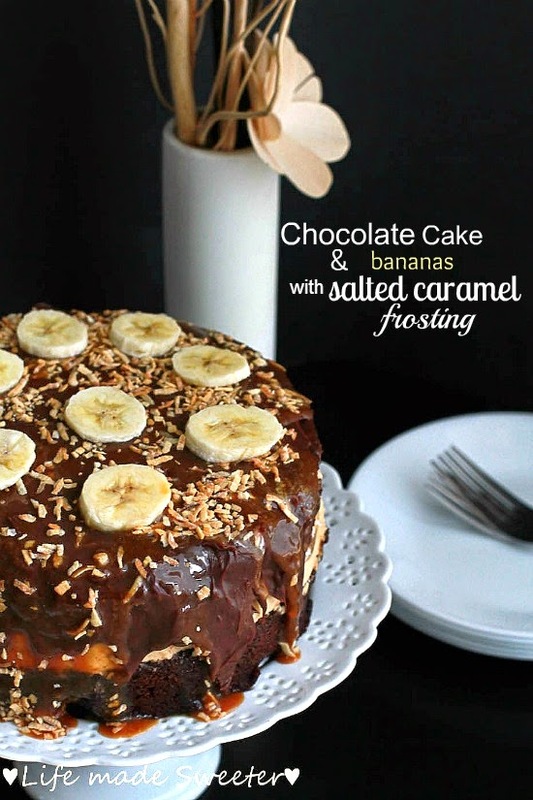 by tweaking his favorite chocolate cake and stacked up the filling with some fun tropical add-ins like toasted coconut and sliced bananas over a salted caramel frosting. The top of the cake is immersed in the same fun add-ins along with chocolate ganache and more salted caramel sauce pouring down the sides. 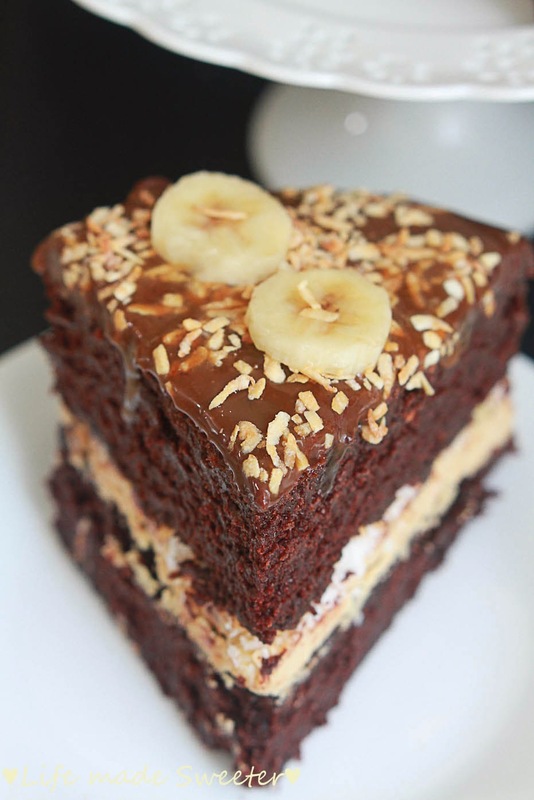 This combination of bananas and toasted coconut is like a vacation for your taste buds and also helps to balance out the sweetness from the salted caramel and chocolate. 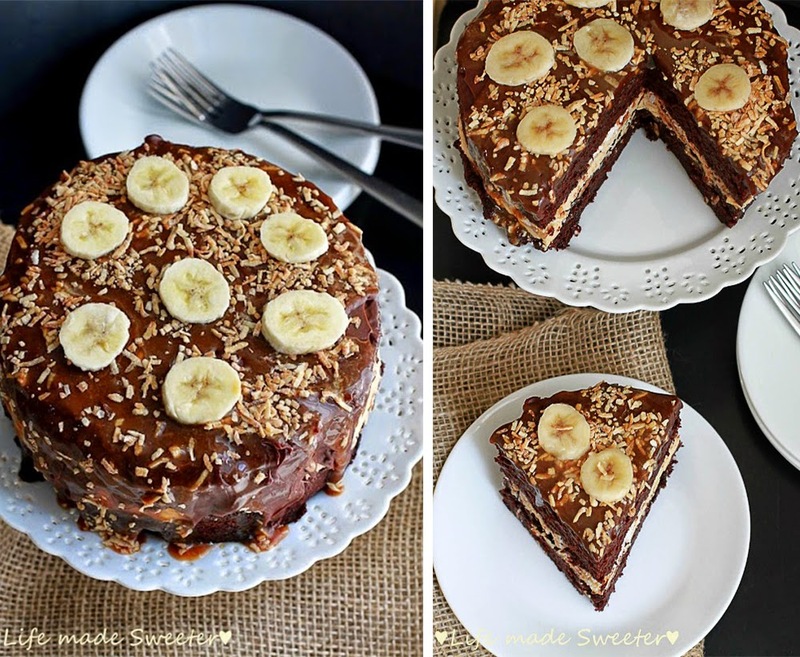 Even though we both have different cravings – this decadent cake was a hit we both enjoyed that was filled with yumminess in every bite. This luxurious cake will satisfy any sweet and salty craving you might be having and it’s perfect for sharing at parties or any holiday celebrations! 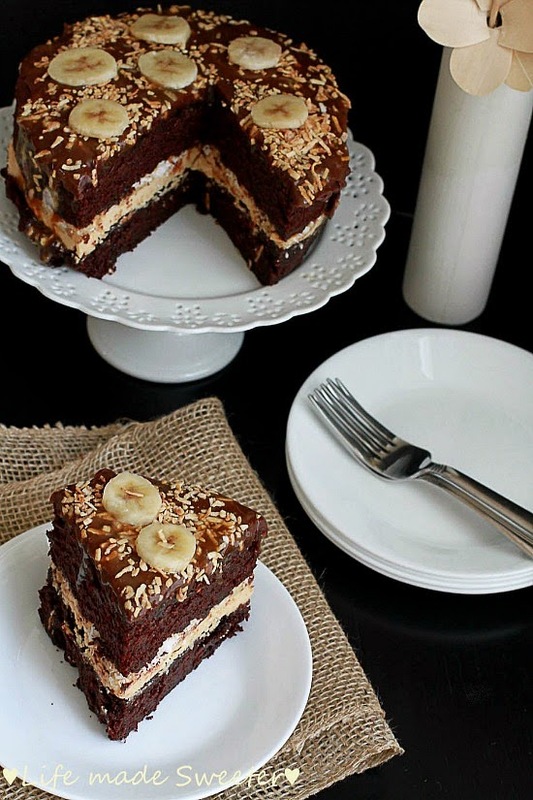 A moist, chocolatey cake filled with sliced bananas, toasted coconut and salted caramel frosting. Smothered with chocolate ganache and salted caramel sauce, this decadent cake is sure to impress. Preheat oven to 350°F. Grease and flour two 9-inch round baking pans. In a large bowl, sift together the flour, cocoa powder, baking soda, baking powder and salt. Set aside. In the bowl of your stand mixer, cream butter and sugar until light and fluffy - about 3 minutes. In a large glass measuring cup, add olive oil, buttermilk, sour cream, vanilla, and eggs. Whisk together lightly to combine. Gradually add to creamed butter mixture alternately with flour the beating well after each addition. Slowly stir in boiling water and mix well using your spatula to scrape up the sides. Pour into baking pans and bake for 30-35 minutes or until a toothpick inserted near the center comes out clean. Cool for 10 minutes before removing from pans to wire racks to cool completely. In the bowl of your stand mixer, beat the butter on medium for 5 minutes until light and fluffy. Pour in the salted caramel and beat until combined. Reduce the speed to low and slowly add the powdered sugar until everything has been incorporated. Turn the speed back up to medium and add heavy cream one tablespoon at a time until desired consistency is reached. Beat until light and fluffy for about 2 minutes. Place chocolate and butter in a large bowl. In a small pot heat the cream until just steaming, but not boiling. Pour over chopped chocolate and butter and allow to sit for 2 minutes. [/b]Place first cake layer onto your cake plate and spread the salted caramel icing into an even layer using an off-set spatula. Add the sliced bananas. Pour some salted caramel sauce over the bananas. Sprinkle toasted coconut flakes on top. Add second layer of cake. Pour the cooled chocolate ganache evenly over the top of the cake and spread so that it drips over the sides. Pour salted caramel sauce over and spread so that it drips over the sides. 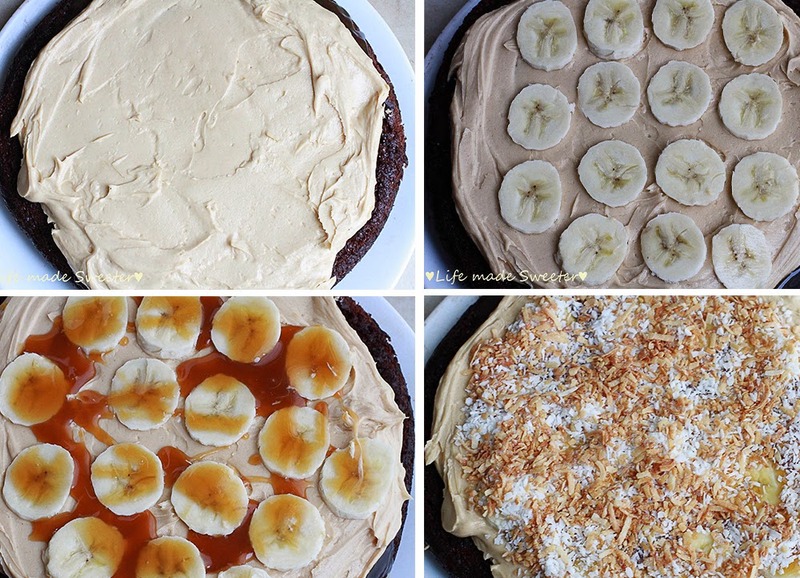 Top with toasted coconut flakes and more sliced bananas if desired.